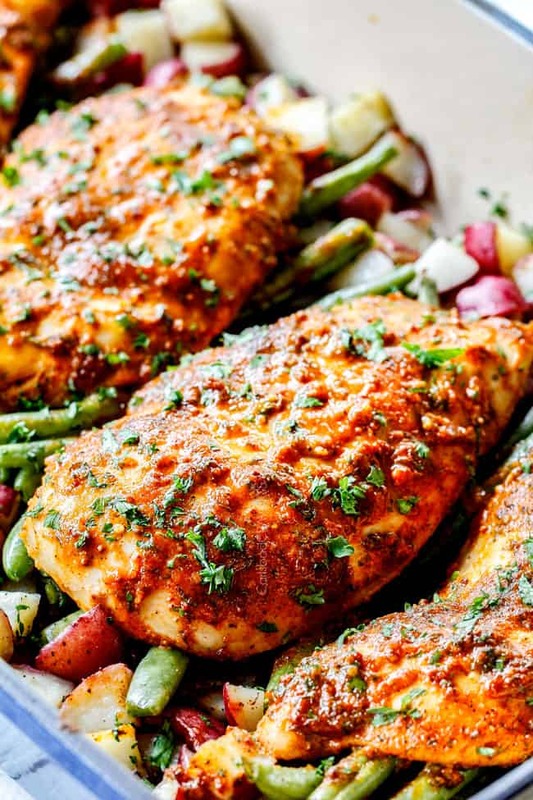 Honey mustard chicken baked with potatoes and green beans for a flavor bursting meal-in-one! 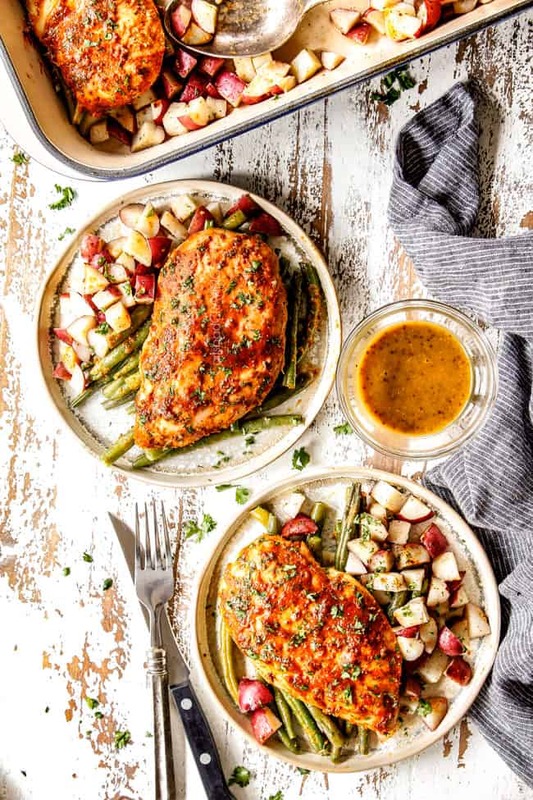 Baked Honey Mustard Chicken is a no-fuss, one-pan-meal OR you can just bake the chicken – either way, this Honey Mustard Chicken is destined to become a go-to chicken dinner favorite! 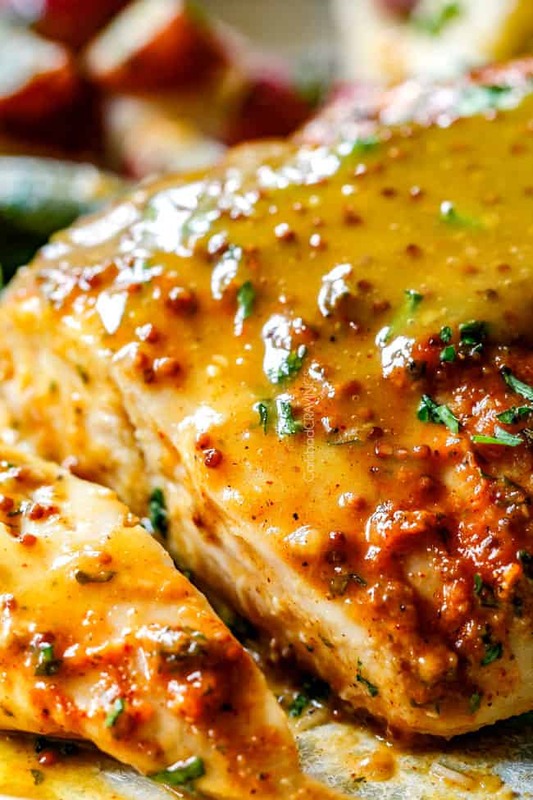 The chicken breasts emerge outrageously juicy from a quick brine and then are slathered in a spice rub and smothered in the BEST homemade honey mustard sauce – no boring, one note Honey Mustard Chicken here! The potatoes and green beans are tossed with salt and pepper then seep up the honey mustard drippings of the succulent baked chicken. You can prep the entire dinner ahead of time then refrigerate and bake for all those busy weeknights. Did someone say winner, winner chicken dinner? This Honey Mustard Chicken was an instant winner at our house. In fact, I made it twice in one week to perfect the recipe and it was gobbled up with pleasure both times. 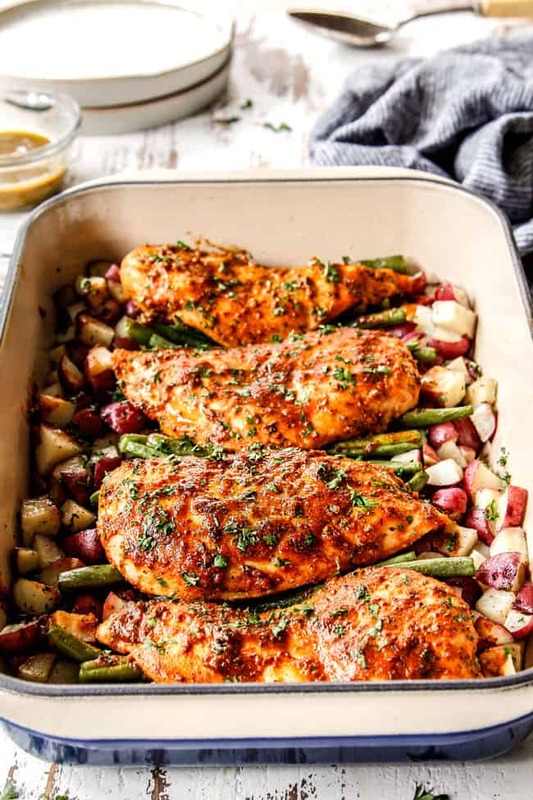 It joins the ranks of my other popular one pan meals such as my Lemon Garlic Butter Shrimp and Asparagus, Chili Dijon Pork with Potatoes and Green Beans, and Garlic Herb Chicken and Potatoes (see more here) – you just can’t beat cooking your protein and veggies/sides in one pan! 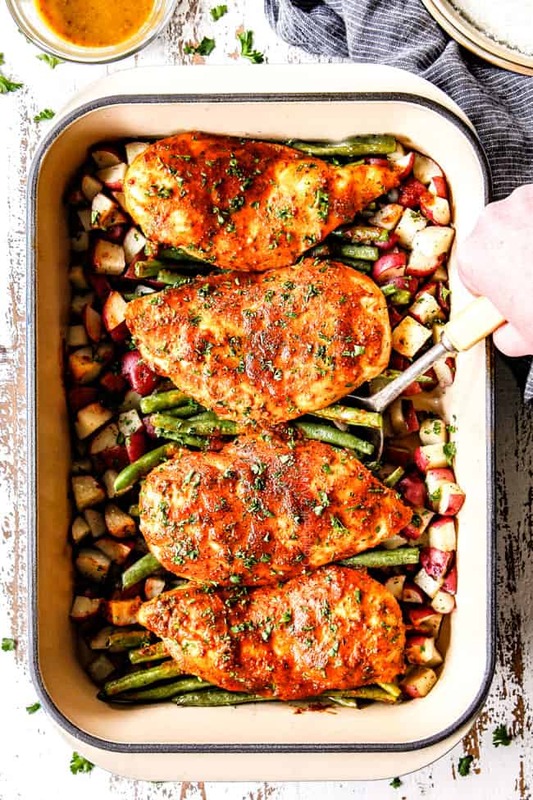 This easy, lazy day Honey Mustard Chicken uses pantry friendly ingredients to deliver a sweet and tangy one pan feast. That being said, if you don’t have green beans or potatoes on hand, or would rather serve your Honey Mustard Chicken with something else, you can skip the vegetables entirely and just bake the Honey Mustard Chicken. 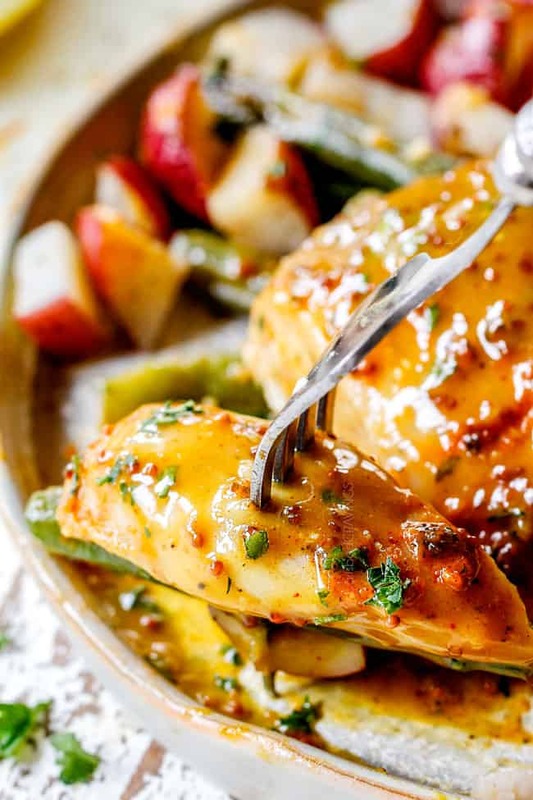 Just promise you’ll make this Honey Mustard Chicken because I guarantee it will be love at firsts bite! What Mustard Is best for Honey Mustard Sauce? 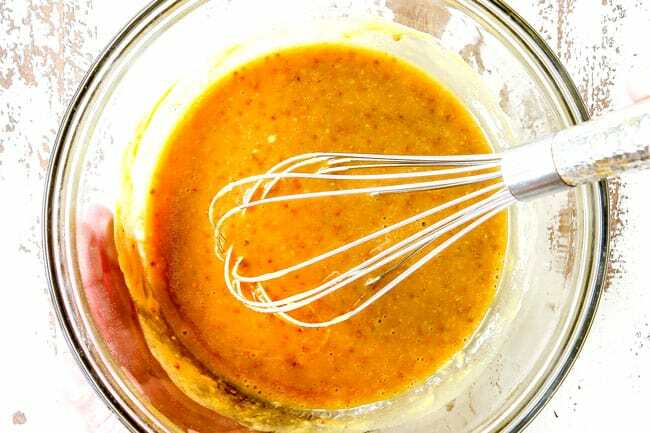 Dijon Mustard: made from fine ground hotter brown or black mustard seeds and white wine which give it a sharp, pungent flavor with a little heat. Stone Ground Mustard: mustard usually made with the hotter brown or black mustard seeds like Dijon mustard but the seeds are only partially ground down, leaving some whole, to create a thick paste. Stone Ground mustard is typically robust and sharp in flavor. Yellow Mustard: a mild, smooth mustard made from fine ground yellow mustard seeds and turmeric for a clean mustard taste. How do you make honey and mustard sauce? 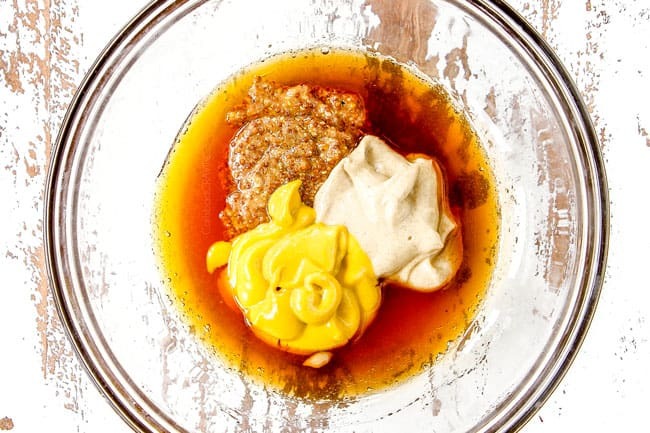 Each type of mustard offers its own varied mustard flair for multi-dimensional flavor. 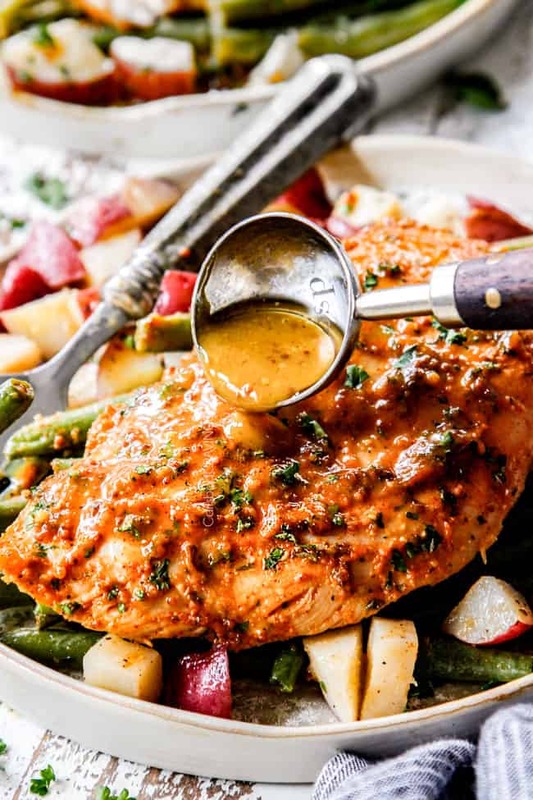 If you taste the Honey Mustard Sauce just on its own, it might taste a little sweet, but when it envelops the chicken bursting with spices, it becomes a mesmerizing sweet and tangy combo. You can make the Honey Mustard Sauce up to 1 week ahead of time and store in an airtight container in the refrigerator until ready to use. Can I substitute Dijon or Stone Ground Mustard? If you don’t typically stock Dijon, Stone Ground and Yellow Mustard, then you can just use yellow mustard plus either Dijon or Stone Ground and use half of each (3 tablespoons each). For example, you can use half yellow mustard (3 tablespoons) and either half Dijon or half Stone Ground (3 tablespoons). HOW TO MAKE CHICKEN JUICY? 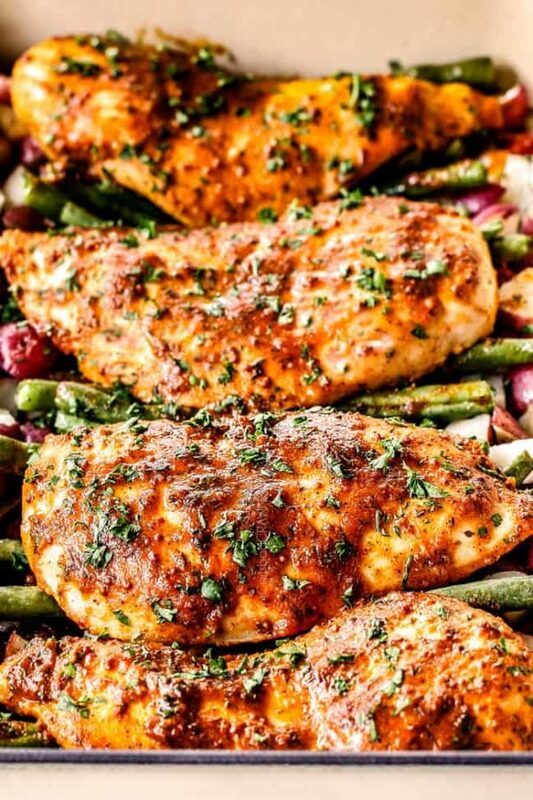 When we think juicy chicken, we usually think juicy thighs – BUT you can transform your chicken breasts into the JUICIEST part of the chicken with a 15 minute brine! You are probably familiar with brining a turkey, (and I always brine all my pork tenderloin), but brining chicken breasts will change your life! Instead of dry, tough chicken, brining produces perfectly tender, juicy chicken, every single time without having to prep and plan ahead with a marinade. To brine chicken, all you do is mix kosher salt with warm water and add your chicken for 15-30 minutes. The salt increases the moisture capacity of the chicken by breaking down the proteins so they can no longer contract when cooking. This means less water will be squeezed out and lost, resulting in juicier chicken. Another plus of brining is the chicken sits at room temperature which makes for more even cooking. Winning! Just a quick note about brining – Do NOT use table salt in your brining solution, only kosher salt. Table salt will make your chicken too salty. Okay, now that you know how to make the juiciest chicken are you ready to make the juiciest Honey Mustard Chicken of your life?! You can just bake the Honey Mustard Chicken and omit the green beans and potatoes if you prefer and go straight to step 3. Add potatoes to a microwave safe dish with enough water to fill 1/4” up the sides. Cover, and microwave for 6 minutes. 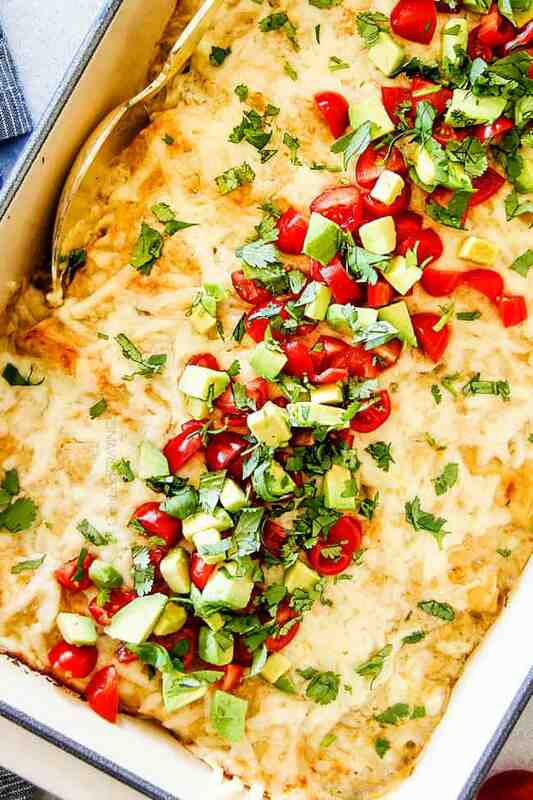 Drain water and add potatoes to a lightly greased 9×13 baking dish. Par-boiling the potatoes ensures they will all be cooked when the chicken is done otherwise they will cook unevenly because they are stacked on top of each other. 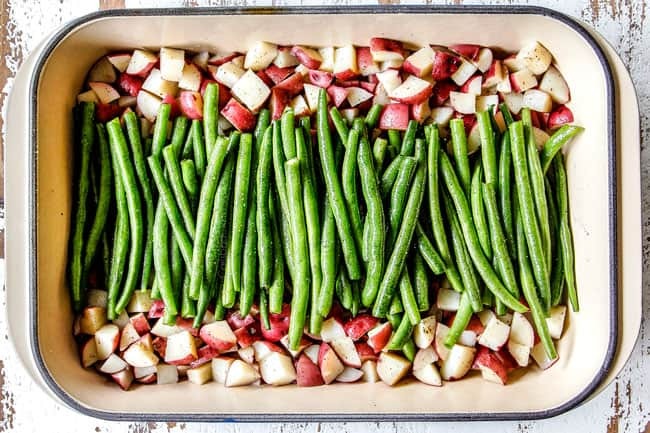 Toss the potatoes with olive oil, salt and pepper then divide them in half and push to the sides of the pan, making room for the green beans down the middle. 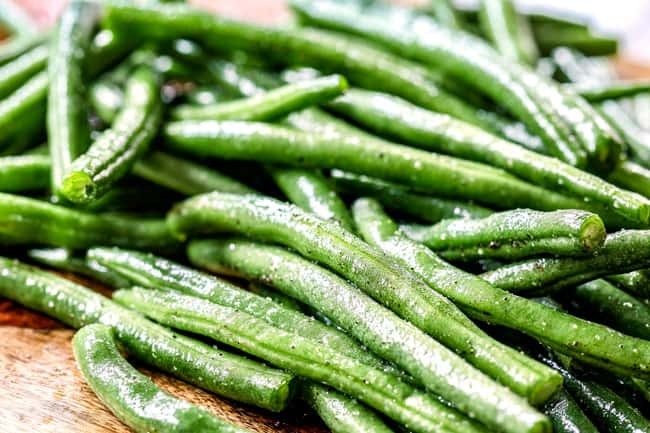 While the green beans are on still on the cutting board, toss with olive oil, salt and pepper. Each element of a dish should be seasoned so it is independently delicious and exponentially delicious all together. Line the green beans down the center of the pan in between the potatoes – they will not be in a single layer but slightly overlapping. Add 1 tablespoon olive oil and all “chicken seasonings” to a large bowl and stir together to make a wet rub. Add chicken and massage the spices into the chicken with your hands. While the chicken is still in the bowl, coat both sides of the chicken evenly in the Honey Mustard Sauce. Transfer chicken to baking dish, and spoon over any remaining sauce/spices from the bowl. Cover Honey Mustard Chicken, green beans and potatoes with foil and bake at 400 degrees for 25 minutes. 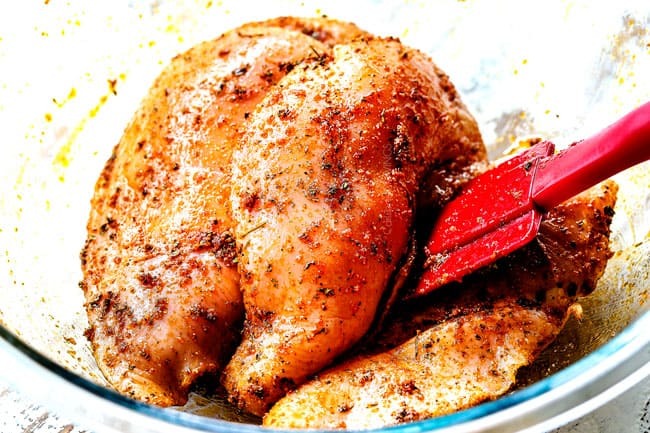 Uncover and bake an additional 10-20 minutes OR until chicken is cooked through (an instant read thermometer should register 165 degrees F, cooking time may be more or less depending on thickness of chicken). Brush chicken again with Honey Mustard Sauce. 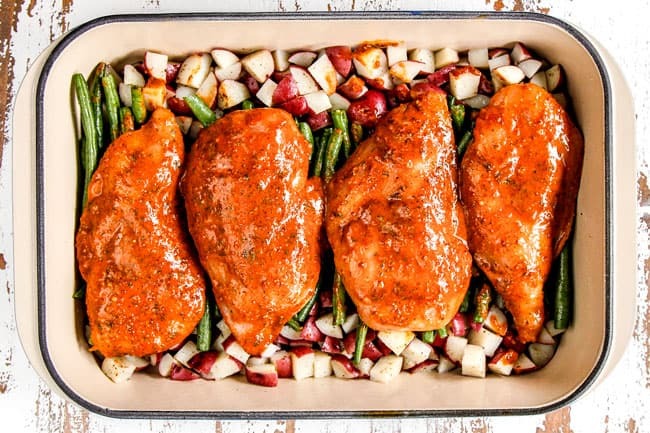 Let chicken rest 5-10 minutes before slicing so the juices that have been pushed to the outside of the chicken while baking can be redistributed and reabsorbed. This Honey Mustard Chicken takes anywhere from 25-40 minutes to bake depending on the size and thickness of your chicken breasts. I highly recommend investing in a meat thermometer otherwise there is no accurate way to check and see when your chicken is cooked without slicing it open and loosing valuable juices. When checking the temperature of the chicken, make sure you insert the thermometer at the thickest part of the meat. The safe internal temperature for cooked chicken breasts is 165 degrees F, so I usually bake it to 160 because it will continue to bake at least to 165 as it rests for 10 minutes. How do you make honey mustard chicken thighs? I chose boneless, skinless chicken breasts because they are leaner but emerge unbelievably juicy with a brine, but you are welcome to use chicken thighs if you prefer. You do not need to brine chicken thighs. To make Honey Mustard Chicken with chicken thighs, you can use either bone in, or boneless chicken thighs, but be sure to remove the skin otherwise the chicken and potatoes will be swimming in grease. 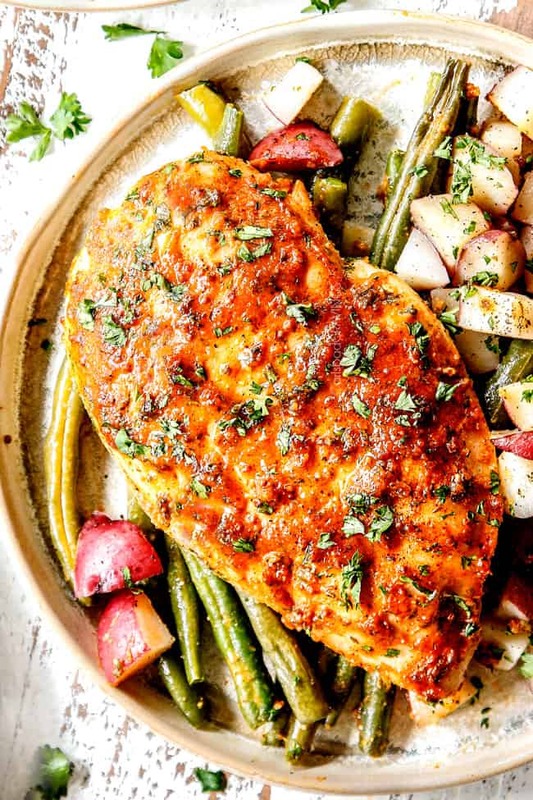 I also recommend searing the chicken thighs before adding to the potatoes and green beans to render some of the fat and to give the chicken even more flavor. Rub with spices according to directions. Sear for 3-5 minutes per side until golden then coat in 1/4 cup Honey Mustard Sauce. 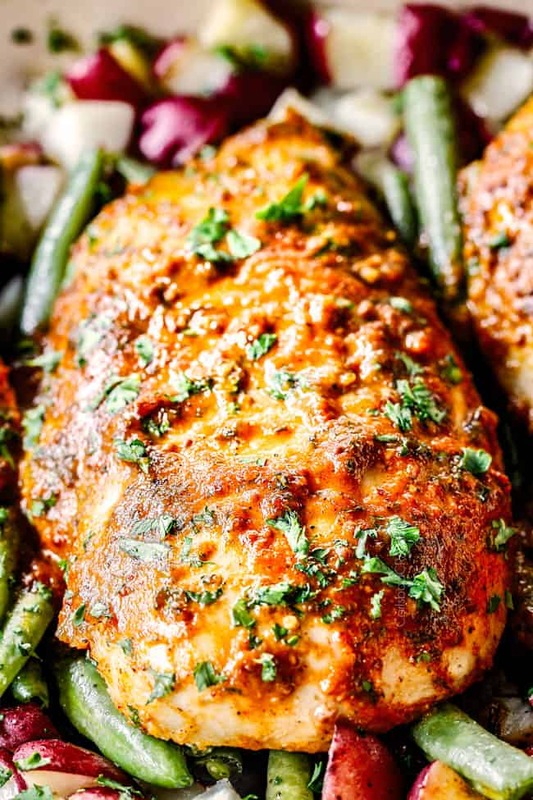 Place Chicken thighs on top of green beans. Cover and bake at 400 degrees F for 40 minutes, remove foil. Check for doneness then continue to bake uncovered an additional 10-15 minutes if needed or until chicken is cooked through and registers 175 degrees F.
Cover and bake at 400 degrees F for 20 minutes, remove foil and check for doneness. Continue to bake, uncovered, an additional 5-10 minutes if needed OR until cooked through. How do you make honey mustard grilled chicken? Brine chicken breasts according to directions. Rub chicken with spices according to directions then coat in 1/4 cup Honey Mustard Sauce. Grill chicken over direct heat undisturbed for 5-7 minutes per side, or until chicken is cooked through (An inserted thermometer should read 165 degrees F). Remove chicken to cutting board and baste additional Honey Mustard Sauce. Let rest 5 minutes before slicing. CAN I MAKE HONEY MUSTARD CHICKEN AHEAD OF TIME? Yes! 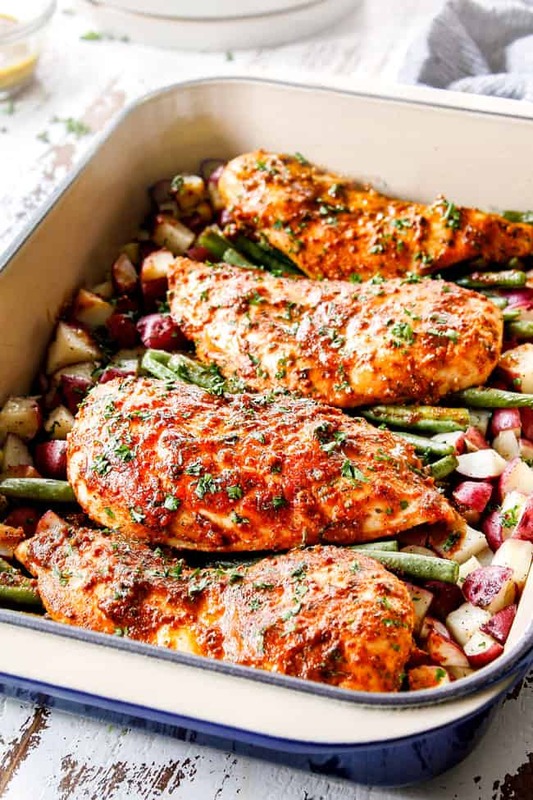 You can completely assemble the Honey Mustard Chicken with the potatoes and green beans up to the point of baking, cover tightly and refrigerate. Cover and refrigerate the unused Honey Mustard Sauce separately. When ready to bake, either let the dish sit at room temperature for 30 minutes (preferable) or be prepared to add an extra 10 minutes or so to the baking time. WHAT SIDE DISHES GO WITH HONEY MUSTARD CHICKEN? 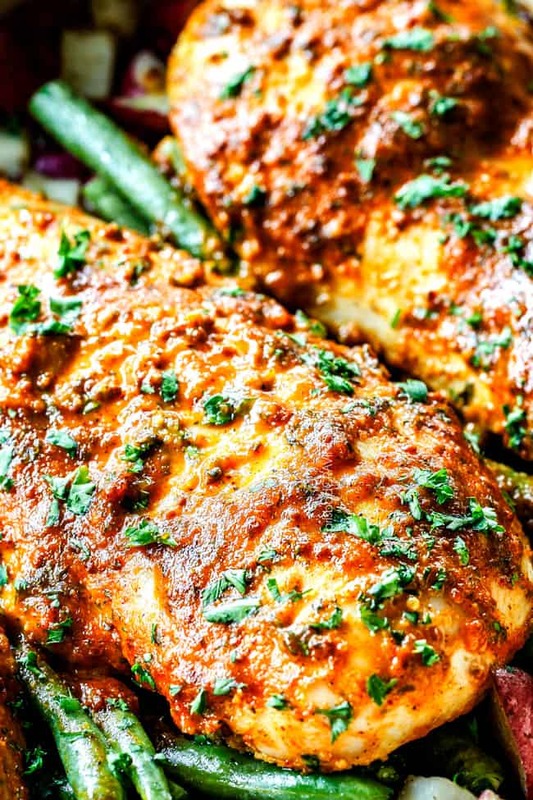 Want to try this Honey Mustard Chicken Recipe? Pin it to your DINNER, CHICKEN or ONE POT WONDER BOARD to save for later! Combine warm water and kosher salt together in a glass dish. Stir until the salt dissolves. Add chicken and let sit at room temperature for 15-30 minutes while you prep the rest of your ingredients. Remove chicken from the brine, rinse in cold water and pat dry. Meanwhile, whisk together honey mustard sauce ingredients in a small bowl. Remove 1/4 cup (to coat chicken before it bakes). Set aside. Add potatoes to a microwave safe dish. Add enough water to fill 1/4” up the sides. Cover, and microwave for 6 minutes. Drain water and add potatoes to a lightly greased 9x13 baking dish. Add one tablespoon olive oil, 3/4 teaspoon salt and 1/4 teaspoon pepper. Toss to evenly coat then divide potatoes in half and push to the sides of the pan, making room for the green beans down the middle (see photos in post). While the green beans are on the cutting board, toss with 1 tablespoon olive oil, 1/4 teaspoon salt and 1/8 teaspoon pepper. Line green beans down the center of the pan in between the potatoes (they will not be in a single layer but slightly overlapping). Add 1 tablespoon olive oil and all “chicken seasonings” to a large bowl; stir together to make a wet rub. Add chicken and massage spices into the chicken with hands. Using the 1/4 cup reserved Honey Mustard Sauce, coat both sides of the chicken evenly in sauce. 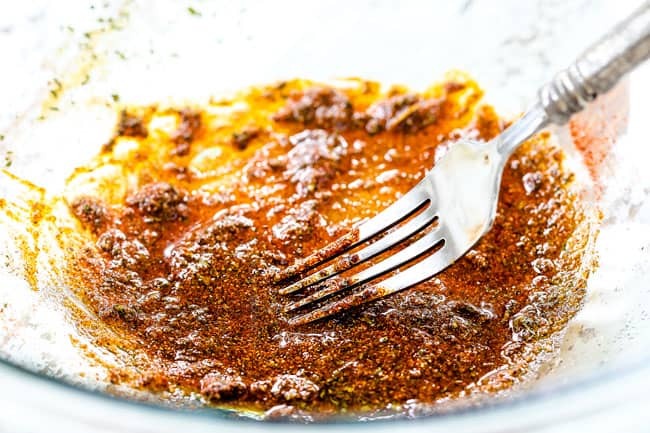 Transfer chicken to baking dish, and spoon over any remaining sauce/spices from the bowl. Cover pan with foil and bake at 400 degrees for 25 minutes. Uncover and check for doneness with a meat thermometer. If needed, continue to bake, uncovered, an additional 10-20 minutes OR until chicken is cooked through (an instant read thermometer should register 165 degrees F, cooking time may be more or less depending on thickness of chicken). Let chicken rest 5-10 minutes before slicing chicken. Serve with remaining Honey Mustard Sauce. *You can use less potatoes and/or green beans and adjust olive oil, salt and pepper accordingly. Yes! 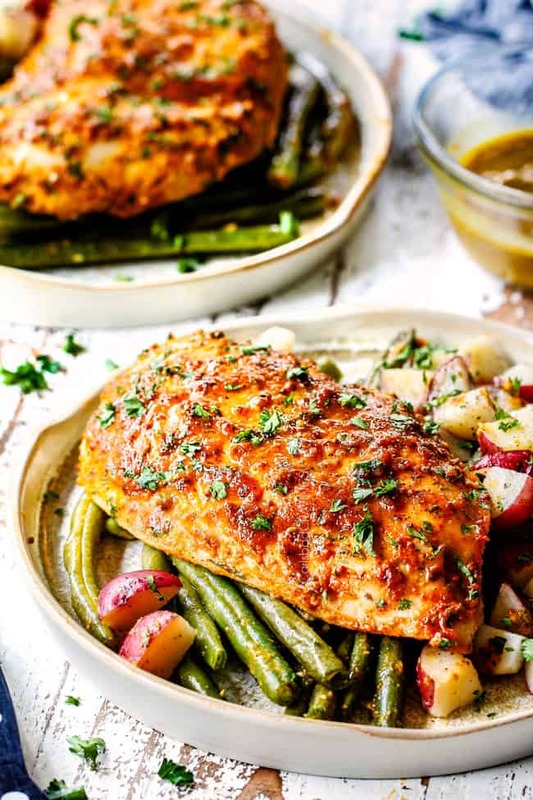 You can completely assemble the Honey Mustard Chicken with the potatoes and green beans up to the point of baking, cover tightly and refrigerate. Cover and refrigerate the unused Honey Mustard Sauce separately. When ready to bake, either let the dish sit at room temperature for 30 minutes or be prepared to add an extra 10 minutes or so to the baking time. Did you really mean 1/4 cup kosher salt ? Yes, it is just the amount for the brine and then it gets rinsed off. Thank you so much Lori for taking the time to comment and make my day! I love hearing that you enjoy reading my posts and my photography. I never expected a food blog to encompass so many different aspects, but I love sharing every single one! I’m excited for you to try this Honey Mustard Chicken recipe! Fellow Carlsbad resident here 🙂 just wanted to say thank you for all your phenomenal recipes. You have helped get me out of my cooking rut, and my family thanks you too! I have learned so many tips and tricks from you and appreciate all the research and info you provide along with your amazing recipes! Hi neighbor, what a small world! Thank you so much for taking the time to say HI! I am so happy my recipes have helped you get out of your cooking rut and you’re learning some tips along the way! I hope you continue to find many new favorites here! 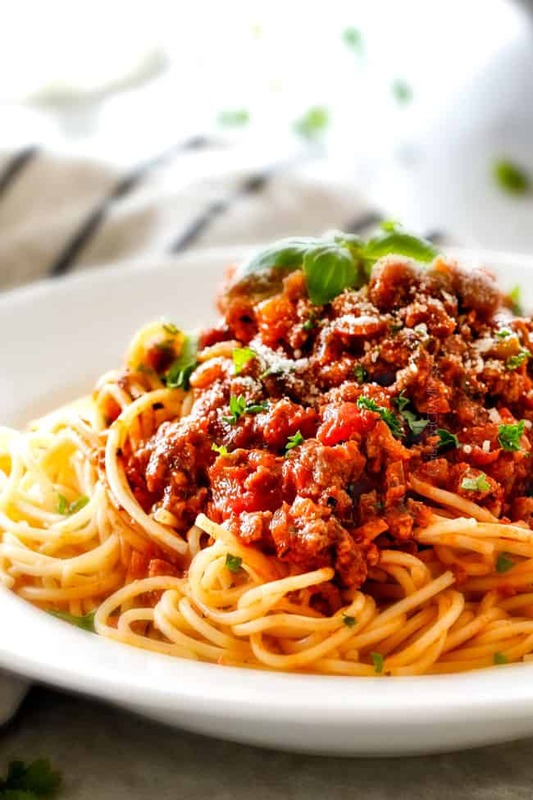 Had all the ingredients so made this for the family over the weekend, it was absolutely delicious and perfect for a winter evening. I really haven’t jumped onboard with the sheet pan dinner trend but this is a game changer and a do-over. Thank you! You are so welcome Stephanie! 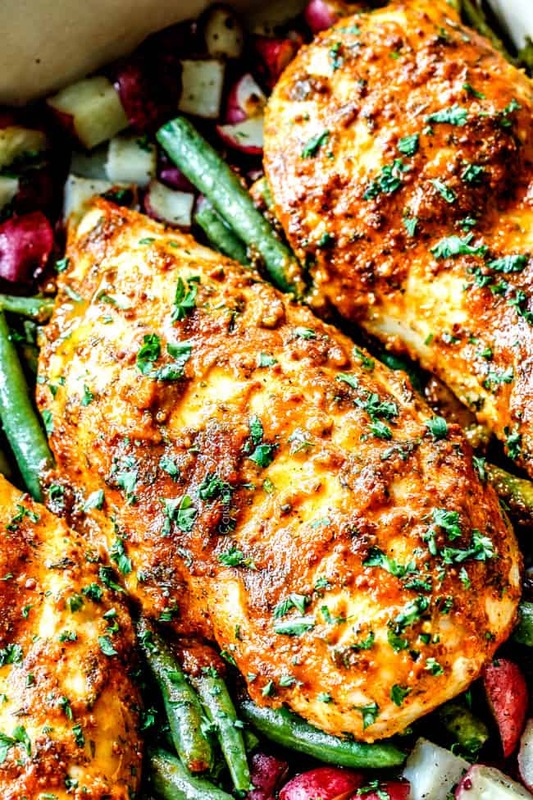 I’m so pleased this Honey Mustard Chicken was a winner and changed your opinion of one pan meals! mmm this sounds soo good! I love me some chicken things! I love funny typos 🙂 You have so many good yummy recipes! Thanks again for sharing with all of us! LOL! Thanks for pointing that out Sandy, all fixed :)! I hope you love the Honey Mustard Chicken! Keep up the good work Jen! Your site is my “go to” for new and interesting recipes. with brining! The green beans were special also soaking up all those tasty juices. I will definately make again! I am so honored to be your “go to” site Beth, thanks so much! I’m so pleased you loved this Honey Mustard Chicken recipe and that it will be a repeat! I’m so glad you discovered the magic of brining your chicken! This is a delicious, easy weeknight dinner! It’s also very forgiving – I just cut the potatoes into bite-size pieces and skip the microwave step. I also don’t cover the pan while it bakes, and it’s done in 35 minutes. We’ve had it twice now, once with broccoli and once with green beans. Hi Sandy, I’m so pleased this is a new weeknight go-to dinner! 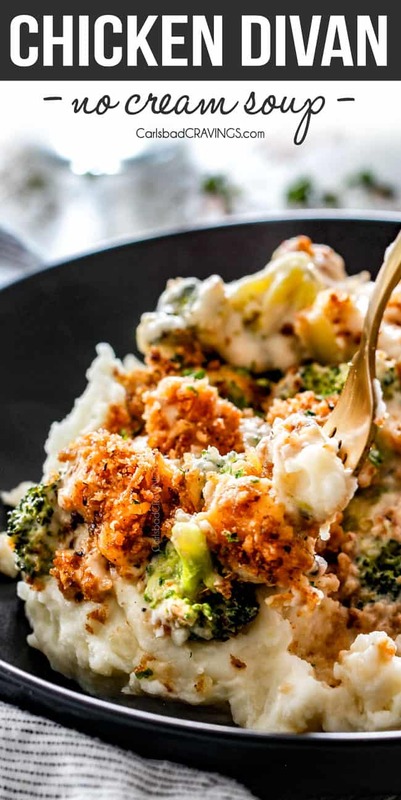 That is awesome you’ve made this Honey Mustard Chicken twice already and customized it with broccoli as well! yum! Strange question … if I bake this at 350, how long do you recommend? I’m waiting on a replacement part for my oven control panel so I can’t turn the temperature up above 350. Hi Misty, I would add an extra 15 minutes or so but in the end it will come down to the size of the chicken breasts. Enjoy! If I’m using the frozen boneless, skinless chicken breasts that aren’t too thick, can I just pound them to flatten them a little, instead of cutting? Also, if using thighs, how many to use? Thank you! Hi Janet, yes you can definitely use those and just check to see if they’re done earlier. As far as thighs, I would use the equal amount of weight. enjoy! I made this tonight and it was so delicious! I loved how the sauce and juices dripped onto the green beans and potatoes underneath. Definitely will make this again. Thank you so much Aimee! The dripping juices are my favorite part too! I’m so happy its a repeat! I only have frozen chicken tenderloins. How would I alter the recipe to use these? Hi Grace, you can use defrosted chicken tenderloins and (depending on their size) add them 12-18 minutes before the veggies are done. Enjoy! We don’t get Kosher salt where I live. How do I brine it without kosher salt? Hi Kaydee, you may use 1/3 the amount of table salt. Enjoy! Made it, really enjoyed it. It’s a keeper. Thanks for the recipe.